Brad Pitt has been hitting the streets promoting the new sustainable houses that are currently being completed in New Orleans as a part of the Make It Right Foundation project that was started a year ago. 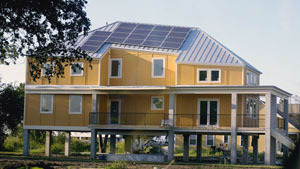 The first six homes have been completed and are LEED platinum, the highest standard achievable. They are the first of about 150 homes that will complete the project over the next 12 months. Pitt appeared on the cover of Architectural Digest for the January 2009 Issue in front of the first of the homes that embody everything that is sustainable architecture-affordable, utilising green technology and embracing sustainable principles. The Lower 9th Ward area is aiming to be the greenest neighbourhood in the United States. Families are expected to save 75% off their energy bills, as well as enjoying homes with good natural lighting and comfort levels. It is hoped that the area will become a model for a concept that could work globally. Pitt has been the driving force behind the project and deserves due credit.